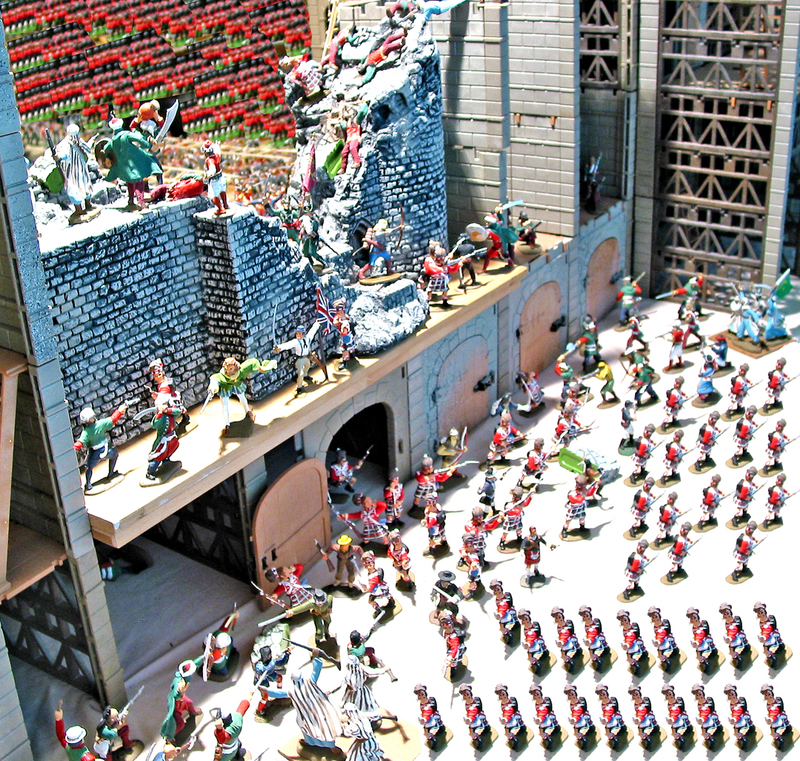 Playing toy soldier war games on a grand scale has been one of the great pleasures of collecting for me. 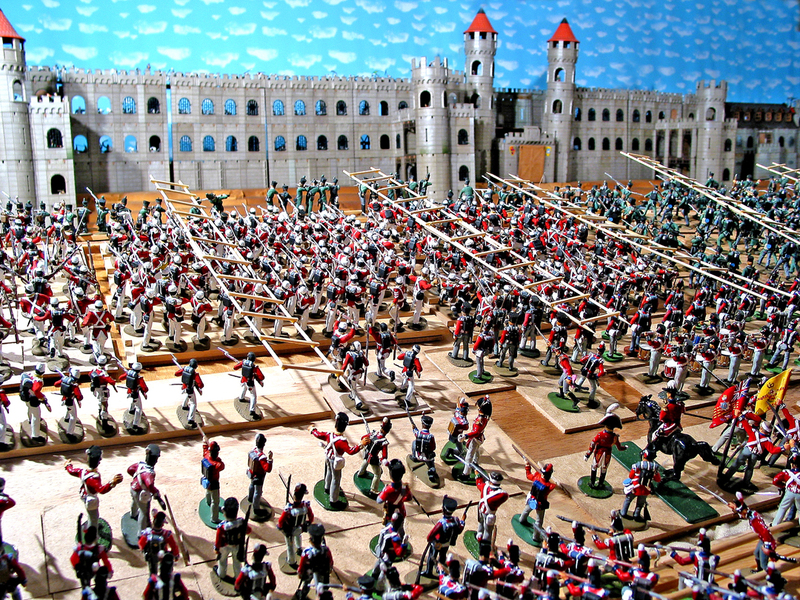 Every step in the gaming process has its own rewards, from the creation of the opposing armies to setting them up in a realistic environment over a wide expanse of floor, table or lawn, from maneuvering a wide array of infantry, cavalry and artillery units through the final goal of fighting the ensuing battles according to strictly regulated rule sets. 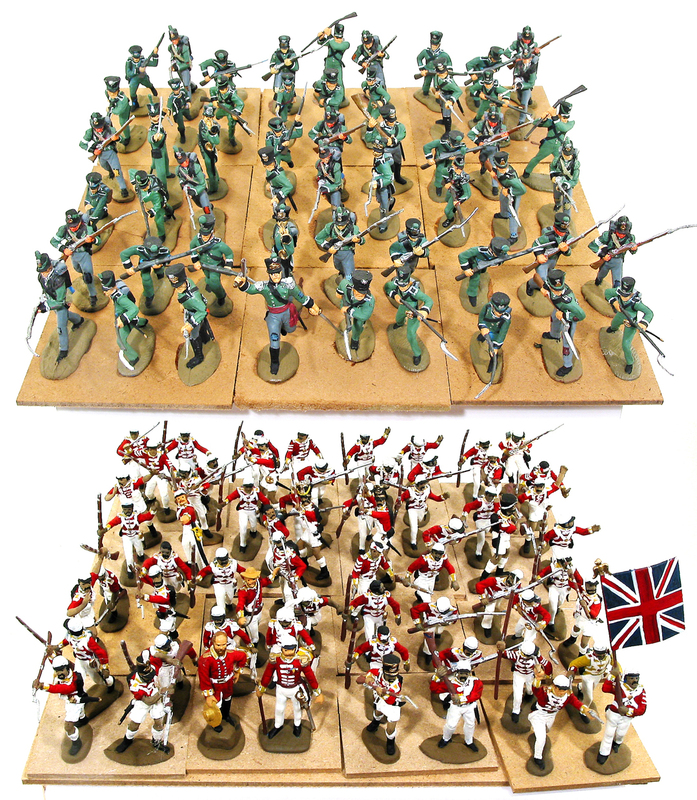 Although most gamers use one figure to represent 30 or more soldiers, I have always preferred a one-to-one ratio. Starting in the mid 1960s, I created a rule set called “Harold’s Rangers.” These rules, which cover most playable eras from the Ancient World through the middle of the 19th century, have been updated and polished over the past 40 years, but have always had the same goal – to offer the player the feel and excitement of all levels of battle from skirmish warfare to grand-scale combat. 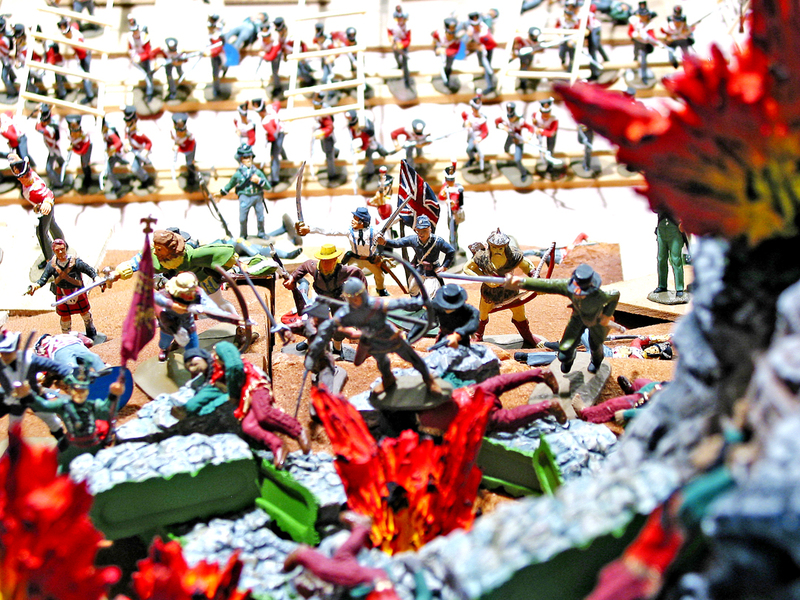 My friends and I have played countless war games, using between 30 and 15,000 figures at a time in battles which took place in every period of history. This article will attempt to explain how a large scale war game is created and played out, covering every step in the process. The first step in any game is to choose the battle you’re going to create or recreate. 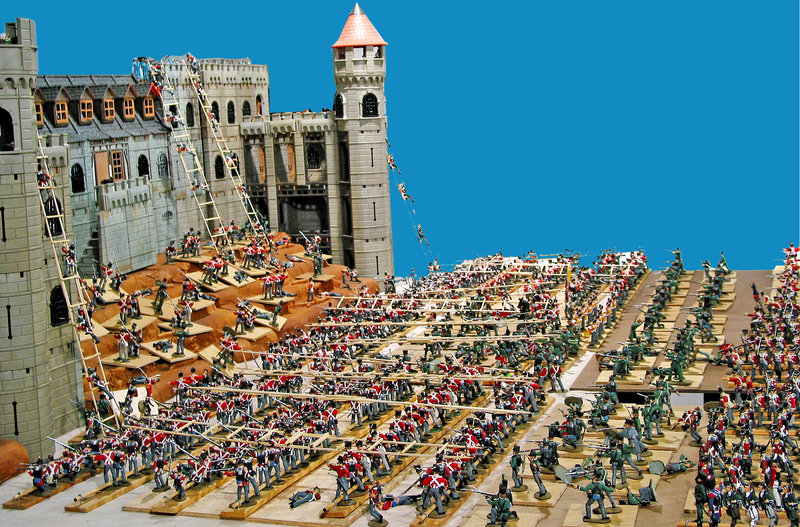 While it’s fun deciding on the period in which you’re going to play, and which troops to use, a more practical choice is selecting the scale of the battle. The scale issue encompasses knowing you have the space to set up AND maneuver the units involved. To a great degree the available playing space dictates game size. 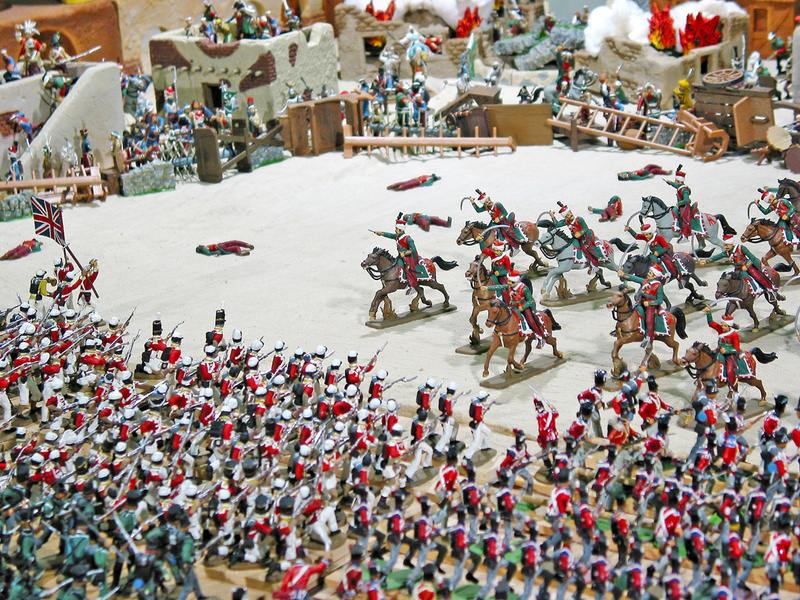 You can always maneuver a few figures in a big space, but packing in too many figures on a table, floor or lawn area without room to maneuver is to be avoided. Next, you should employ a map, or series of maps, to allow movement of the armies to be involved before they reach the point of contact. (See footnote 1) As most of our games are not recreations, but fictionalized battles, my friends and I generally draw our own maps, showing the terrain on which the conflict will be fought. In the case of a game which begins at some distance from the battle site, a large scale map might also be drawn to show the approach road net, then other maps can be utilized to “zoom in” to the actual site. In any case, once you have your maps, the initial game creation stage is complete. 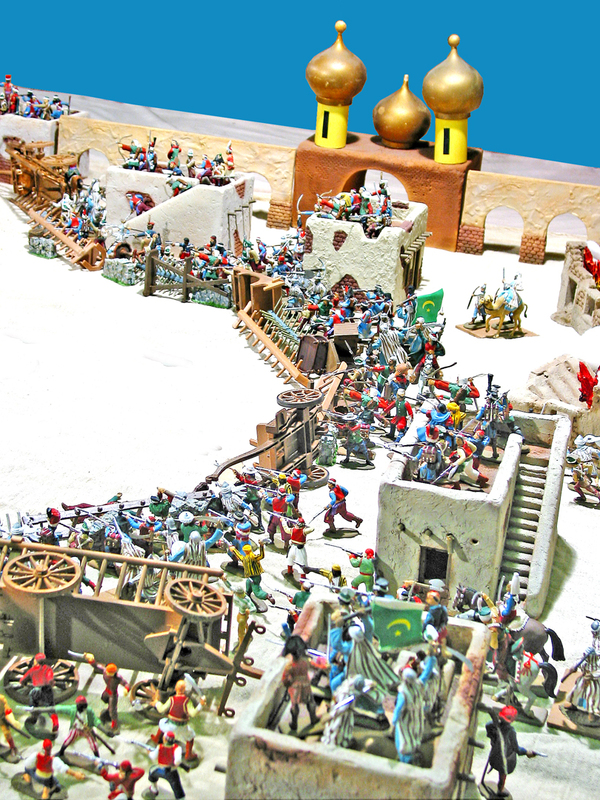 For this article I am using a battle from a campaign played against the Barbary Pirates. It’s an assault in the year 1805 on a fortified North African city which serves as a pirate base. Here’s where the real fun begins. Which armies have you chosen for your game? For this game, the opposing armies are a defensive force of 2,000 Barbary Pirates, North African mercenaries and a European freebooters, piitted against an assault force of 6,000 British Infantry, Highlanders and Riflemen, reinforced by American, British and Bombay Marines, and a mixed lot of 1,000 characters who have seen long service in Harold’s Rangers. As I already had numerous painted bodies of troops to use for the British and their allies, as well as the North African mercenaries and Freebooters who served in the pirate army, my aim in this game was to create and paint most of the Barbary Pirates. 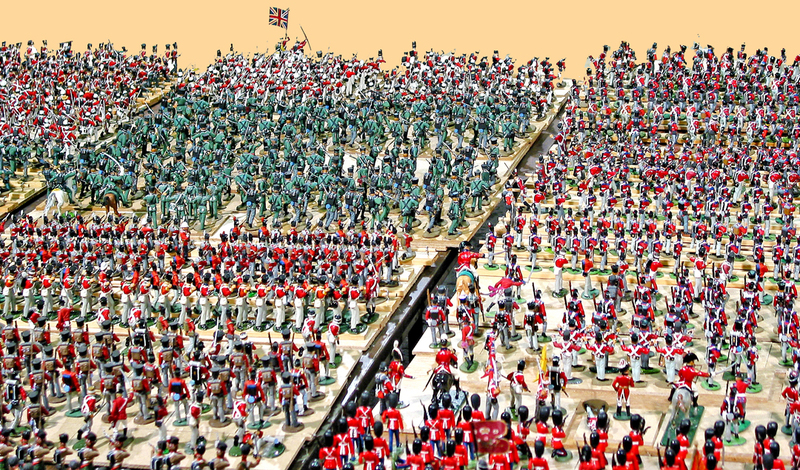 The challenge was to try and amass about 600 painted soldiers who would look like they belonged together. 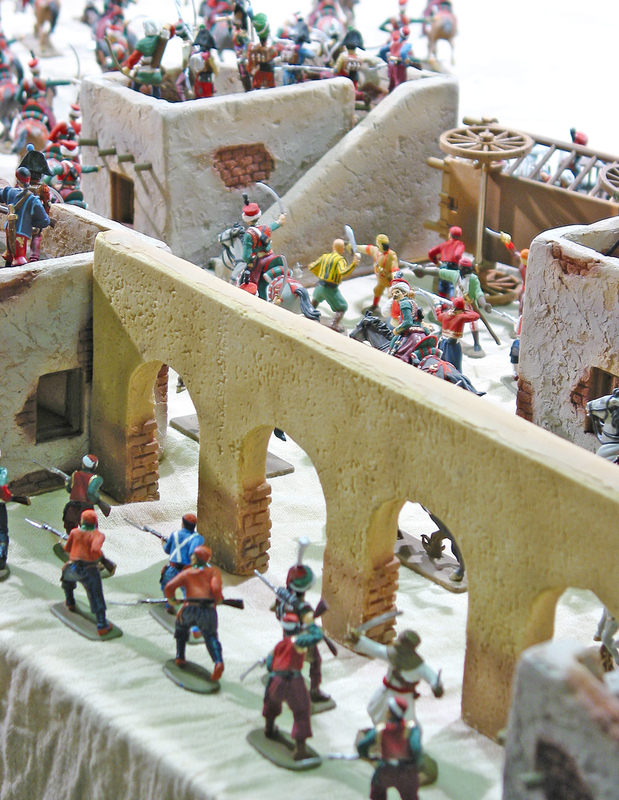 I chose Ron Barzso’s Barbary Pirates as the ideal “look” for the regiment-sized force I was assembling. As he has only made one set of 13 figures in 7 poses, however, the first step was to choose similar sets which could be altered by creative painting to mix with the Barszo soldiers into a cohesive group. I was looking for baggy trousers, headgear which might be appropriate and weapons of the period. 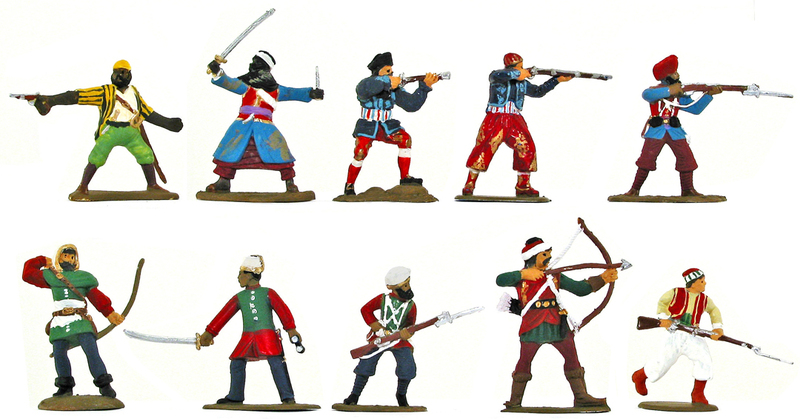 I chose (left to right, top row above) Hing Fat Pirates, Armies in Plastic Arabs, Barzso Pirates, HAT Zouaves and Armies in Plastic Indian Infantry (second row, left to right) Barzso Robin Hood Merry Men, Armies in Plastic Egyptian Infantry, more Armies in Plastic Indian Infantry, Jecsan Huns and more Hat Zouaves. In addition I used numerous boxes of Italeri’s Mamelukes, and added Britains, Jecsan and Reamsa Moors, pirates by Ideal, Marx and Charbens, and, just because they looks so appropriate for the period, a contingent of Italeri and Hat Napoleonic French Infantry (shown below) These were a reach, but I figured that when Napoleon’s army was evacuated from Egypt, their stores, including thousands of uniforms from the many casualties suffered throughout the campaign, were on sale in souks across the length of North Africa). 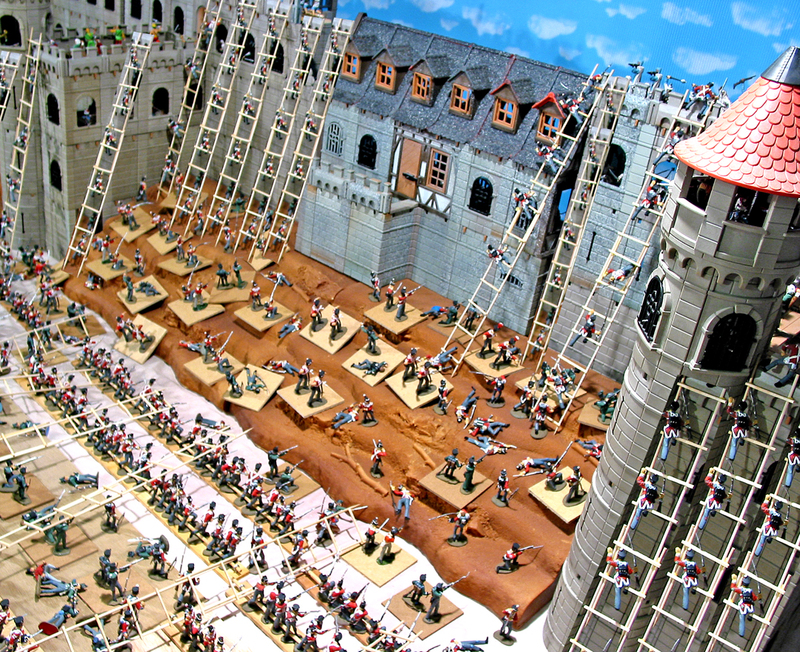 I have long been fascinated by the concept of the escalade, a sudden assault on a walled town or citadel accomplished with the use of scaling ladders. Wellington (then Wellsley) used this method in India in his attack on Ahmednuggur in 1803, and, later in his Peninsula Campaign against Badajoz in 1812. For our game, I posited an escalade attack by the combined Anglo/Indian/American force against the pirate-controlled city. With this escalade in mind I built the set for the game. 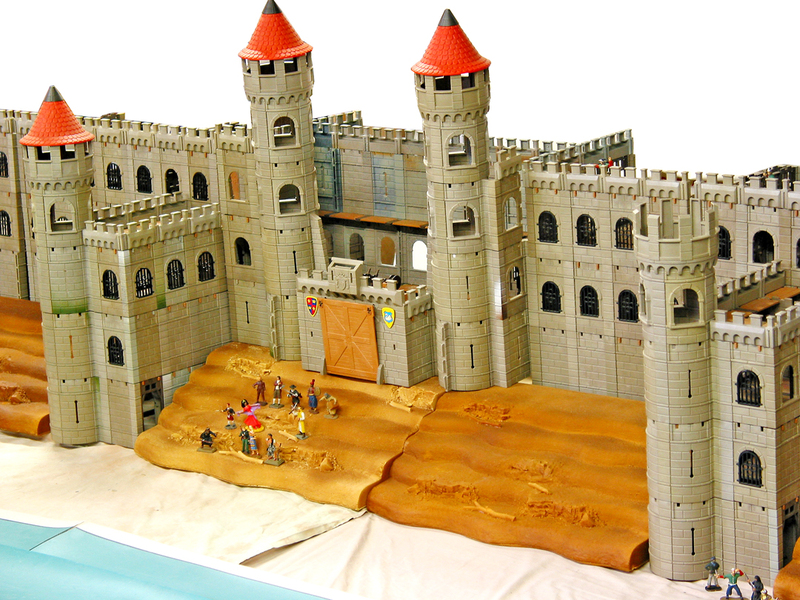 Using thousands of pieces from the Playmobil castle system, I spent 30 hours building a 20-foot wide, 2-foot high and 2-foot deep city wall. 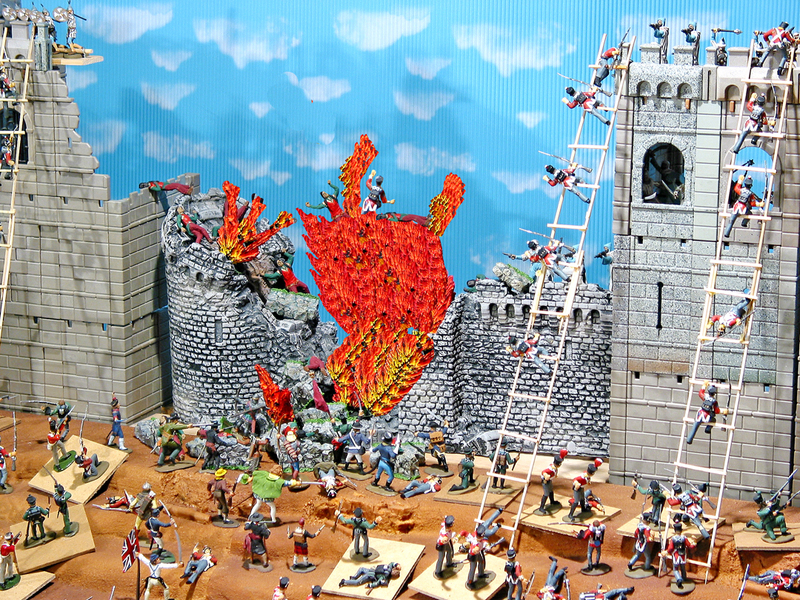 This wall featured projecting towers to provide flanking fire against ladder parties, numerous ground-level hidden doors to allow sorties by the defenders, and a strongly-defended gateway. 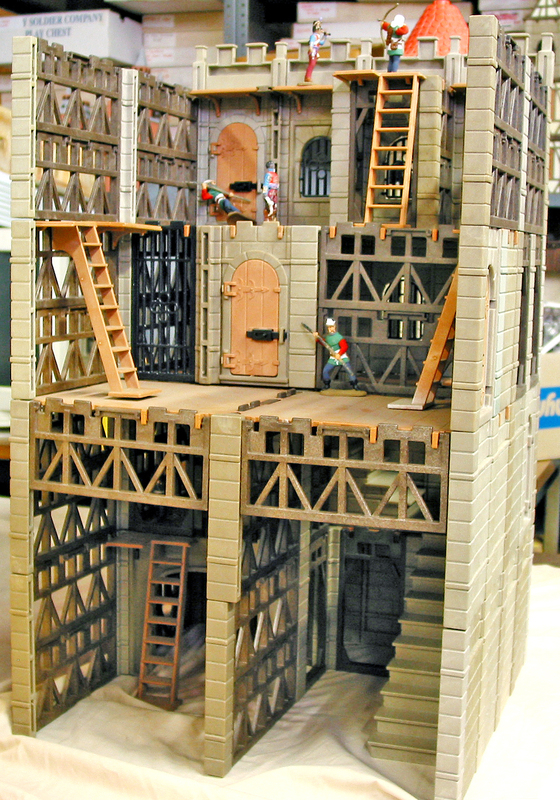 The wall features dozens of rooms, stairways, cul-de-sacs and defendable fallback positions built within the massive structure to allow all sorts of different smaller skirmishes when and if the assault force gained the top of the walls. As an escalade attack is such a challenge, I opted for giving the players who were running the allies a fair amount of intelligence in helping to plan their assault. I drew a map of the entire city. This allowed us to play a one-day game in which the participants moved markers representing characters from Harold’s Rangers within the city as a means of gathering information for the forthcoming battle. I was running the game (as umpire/ storyteller/dungeon master) so I took the part of the pirates. We all talked through a series of imaginary adventures, exploring the city’s gates, defenses, marketplaces, palaces, harbor approaches, dens of vice and corruption and other sights. The allied team used the information to establish a plan of attack, and arranged some “inside help” by rolling dice to have several of the Rangers enlist as mercenaries in the service of the pirates to help protect the walls. Once the map moves were completed and the gaming table was set up, the work of putting out the opposing armies began. 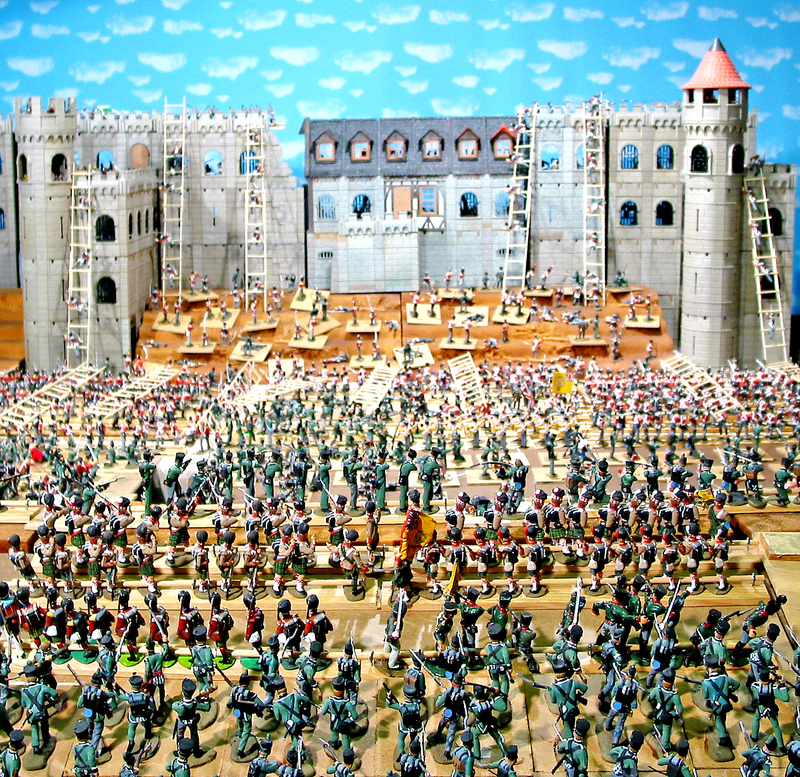 The first step in this process was to be sure that the overwhelming number of the 9,000 figures to be used in the game was based. This is an essential step in grand-scale wargaming. 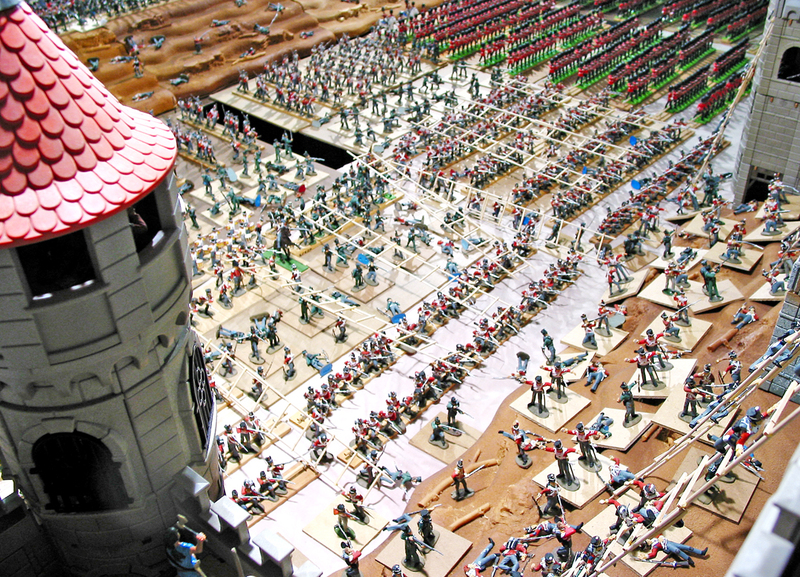 Imagine having to set up 9,000 figures one at a time, then having to move each one as the game turns progress. It would take days for each turn. But, using movement boards, almost every figure used in our 17th/18th/19th century games is based. The first method is glueless, and is best-suited for regular infantry units. I have a lumber yard cut 12-inch lengths of wooden battens. These are about 1/8 inch in thick and an inch wide. Then I screw the “eyes” from hook and eye sets into the ends and middle of each stick. I can place 12 figures on each stick, holding them in place by running a 12-inch dowel through the eyes. The second method uses glue and is more appropriate for skirmishers, irregulars, troops in column and command units. 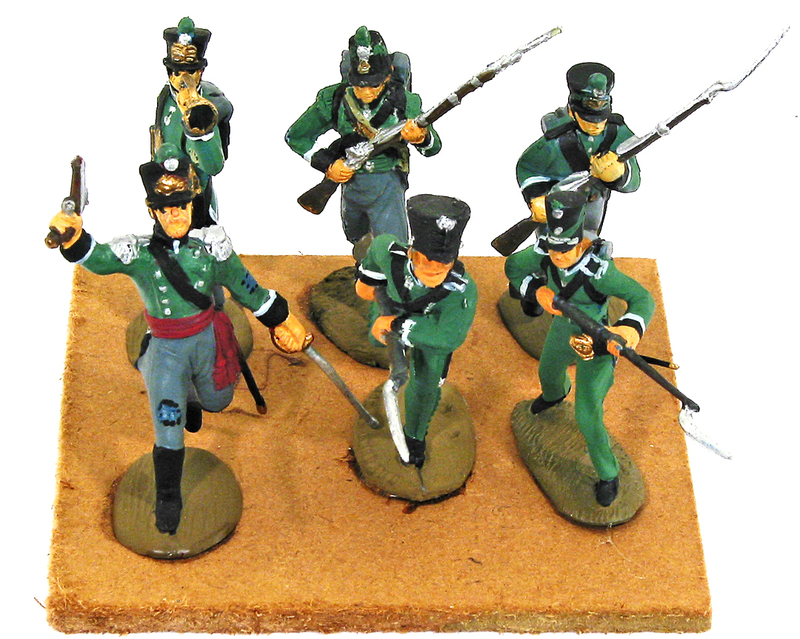 I glue pairs of skirmishers British Riflemen are shown) on 3 inch x 3 inch squares of 1/8th inch-thick masonite. Regular infantry on the march are placed in groups of 4 (2 rows of 2) on 3 x 3 squares. For groups of 9 (3 rows of 3) I use 4 x 4 squares. Trained infantry are in ordered rows. Mobs and untrained groups are more haphazardly placed. 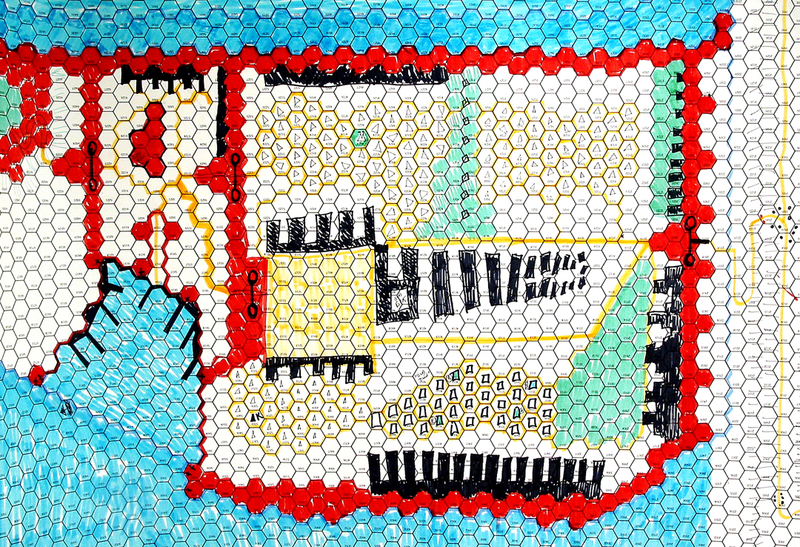 I place the finished battens and/or masonite squares on larger 12 x 12 inch masonite squares. These 12 x 12’s can also be grouped together on 24 x 24 inch squares, the largest size of board that can be easily moved. A 12-inch square of 12 battens holds 144 troops, a 12-inch square of 16 3 x 3’s holds 64 and a 12-inch square of 9 4 x 4’s holds 81. 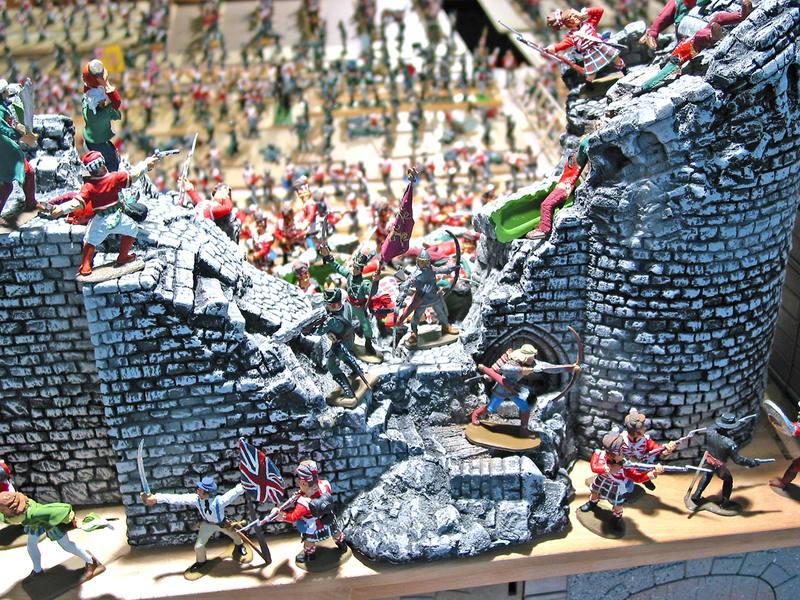 The most a 24 x 24 inch square can hold is 576 figures, which is a large regiment on campaign. I retain numerous figures which are not placed on or glued down to bases. For while one can always take glued figures off their movement boards, loose figures are used to “make change” when removing casualties and to fight out little skirmishes in the confines of a house, on a castle wall, or wherever boards are out of place or too big to fit. Finally, the set is built, the armies are based, the players have gathered their intelligence and formed a plan of attack. It’s time to play. 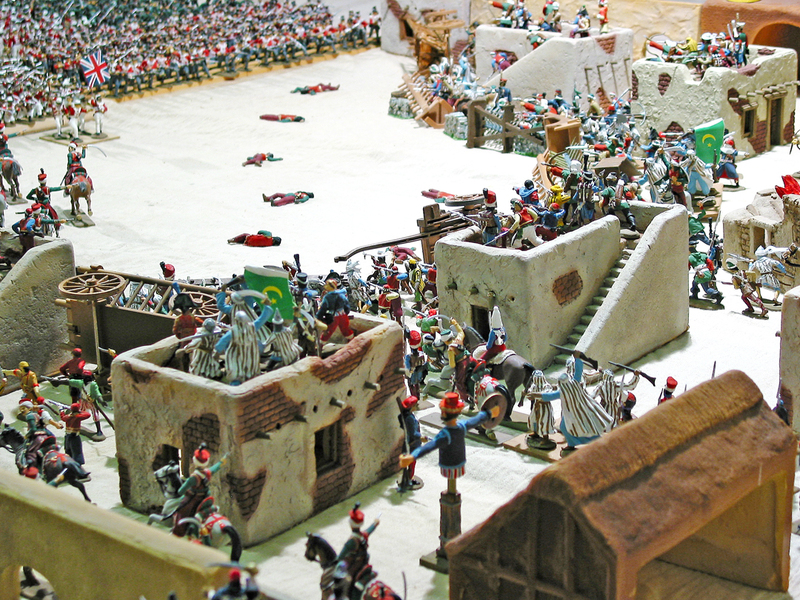 In some games the armies enter the playing area using a timetable, with some units starting in the playing area while others arrive on the playing field according to a schedule. For this game, we used cardboard markers on the map to show the location of each unit when the game started. As the attackers had decided on a surprise assault just before dawn, they had the advantage of knowing that the defending army was scattered around the city, in barracks and on guard duty. The pirates had only one full regiment assigned to duty at the wall, and (determined by die rolls) only 20% of them were actually on guard while the rest were asleep in guard rooms within the wall’s built-in quarters. The attackers, however, were concentrated beyond sight and sound of the defenders. The city was overlooked by a sandy bluff, behind which the attackers had formed into their attack columns. 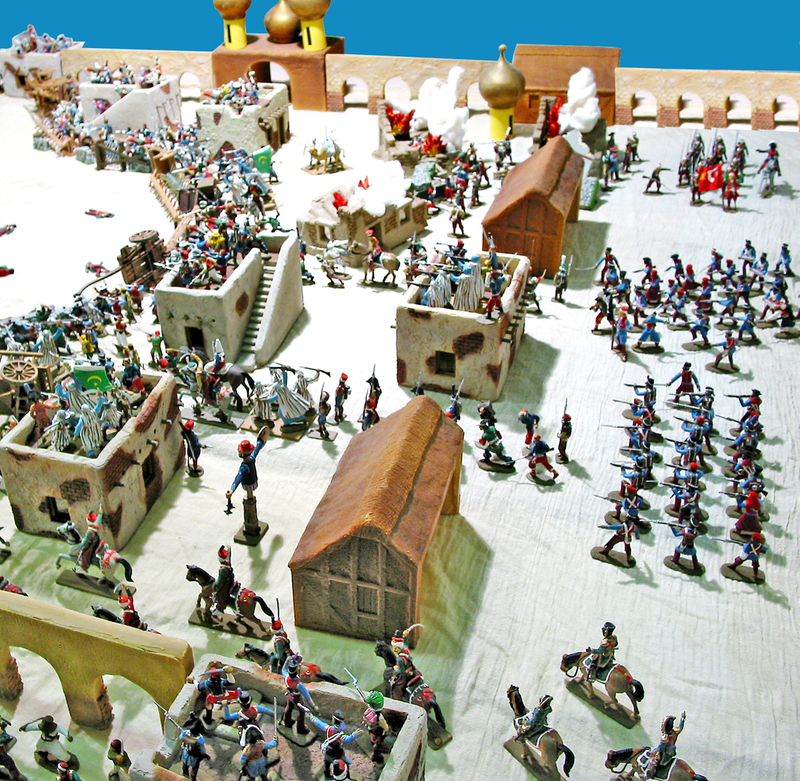 The first move of a game is usually determined by a dice role to see who gets the initiative, but as this was a surprise attack the initiative automatically went to the attacking army. First, a word about time scales. In a war game, time can pass very quickly. This might be the case when an army is on the march across country, where game-spanning days can pass in a moment, as both players agree that no surprise attacks are planned, and no encounters will take place. But when troops come into contact, time slows. Thus, throughout the game in progress, even when we were talking through the exploration of the town, time passed as quickly as we talked, measuring in hours and days in a few moments. As soon as the attack commenced, however, we spoke in terms of phases. In “Harold’s Rangers,” the smallest measurement of time is a phase, which equals 5 seconds of real time. As the attackers approached the wall, they moved in columns, at the quick march, carrying ladders. They were moving in semi-darkness, as the attack was going in at 5 am, and they were traveling across broken ground. Using the “Harold’s Rangers” movement tables, this meant the attack columns were moving at 4 inches per phase (1 inch equals 1 yard in game scale). As their starting position was 120 inches way from the wall, this meant that if they made the approach unimpeded, it would take 32 phases (32 turns = 12.5 minutes of game time) to reach the point at which they could raise their ladders and begin climbing. 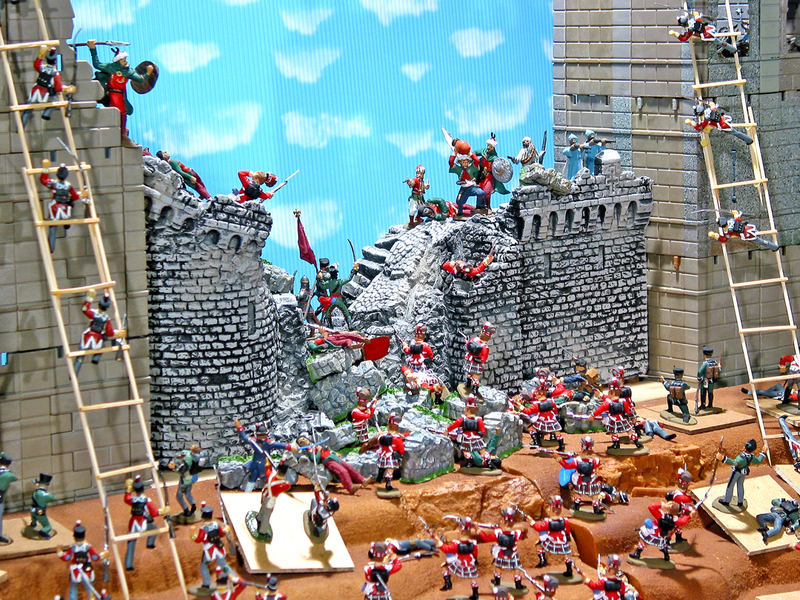 During the first few phases of this 12.5 minutes of game time, the lookouts on the walls saw the attacking columns. They sounded the alarm, waking the rest of the regiment stationed to guard the wall. The sleeping troops armed themselves and rushed to their assigned posts. Further alarms were raised throughout the city, where regiments began to mobilize to reinforce the defenders. The attacking columns come into range of the bow-armed defenders as soon as they crested the rise of the bluff behind which they had been sheltering. The defenders who were armed with bows began firing upon them. This was a tough shot, as the attackers were moving and the pre-dawn light cut down the chance of a hit by 20%. Nevertheless, as the attackers presented such a big target, they started taking casualties. As the attack columns got closer, they came within musket range. Although muskets are notoriously inaccurate, when fired en masse they did take their toll. Thus, when the columns reached the environs of the wall they were somewhat thinned. As the attackers reached the wall they threw up their ladders and began to climb (see Footnote 3). The defending regiment, all of whom had now reached their posts, poured fire into them from front and flank positions. The darkness helped keep the casualties down, but with all that lead, arrow flights and grenades coming in from all sides the wounded count continued to rise. While this was happening, troops from around the city were rushing to reinforce the wall. These troops were not yet on the table – the moves were being made with cardboard markers on the map – but there was a lot of tension as to whether they would arrive in time. 25 minutes of game time had passed. The moves until now had taken a full day of real time to play, considering the volume of fire being thrown out against the attackers, the number of die rolls required to simulate it, and the time it took to remove casualties and continue to move the attackers forward. The troops of the first wave who had crossed the open ground, thrown the ladders against the wall and climbed into action were taking heavy casualties. Then a second wave of allied troops crossed the bluff and moved at the charge to reinvigorate the attack. While the assault continued, a section of wall was blown up by a unit of Royal Engineers who set kegs of gunpowder against a weak spot in the outer wall. This was when their friends inside (remember the Rangers who had joined the defenders as mercenaries?) acted as well, lighting the fuse on a similar charge inside a lower storeroom which they had placed on the day before the attack. The result: a breach! A picked group of Harold’s Rangers and 78th Highlanders had been standing by for just this moment. Forming a Forlorn Hope, they rushed into the breach to gain a toe hold in the defenses. The Rangers and the 78th broke through the breach, attacking the defenders to begin clearing them from the walls. 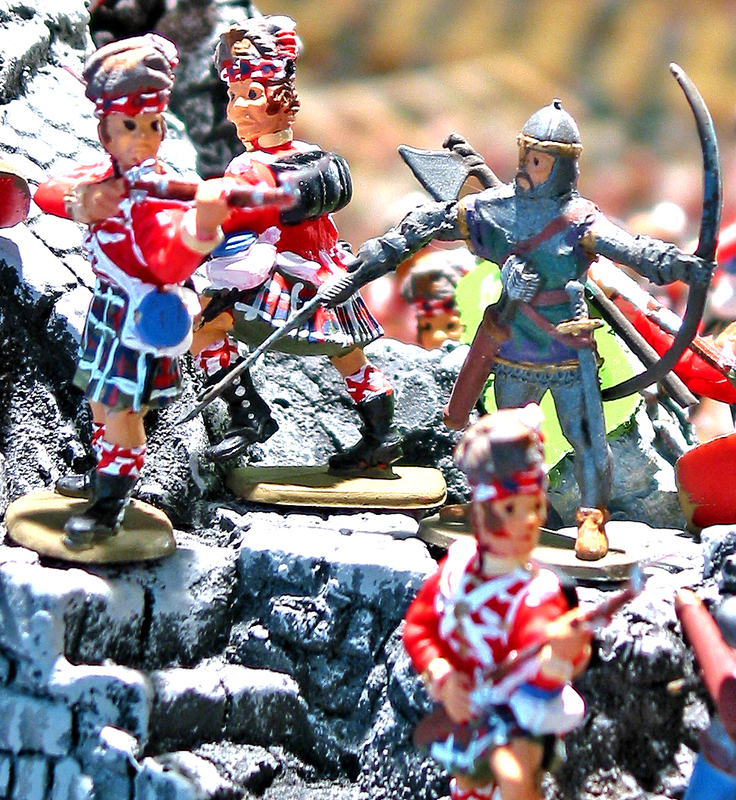 Fresh troops of the 78th Highland flooded through the breach. Joining the Forleorn Hope survivors, the 78th Highlanders spread out to the right and left, clearing the walls. Meanwhile, outside the city, the weary troops of the first wave, who had been fighting their way up the ladders, were reinvigorated and renewed their assault. All was not lost for the pirates, however. Reinforcements who had been coming up to reinforce the walls saw the breakthrough and fell back to prepare a second line of hasty defenses in the town square. Pirates approach the town square to strengthen the second defense line. Piling up furniture, wagons, household goods and anything else that might stop a bullet or hold back the allied bayonets, the pirates built a hasty defense in the town square. Meanwhile, the Allies, having secured the town wall, reformed their regiments. The less weary and barely depleted units of the second wave advances to assault this second line. Regiments of British and Yanks, Indian and Scotsman stormed the second line. Despite a gallant charge by the Pirate King’s Horse Guards, the inexorable Allied line contiued to advance. After a brutal hand-to-hand struggle, the defenders fled into the night while the city fell to the victors. This was just one example of one of our large scale gaming experiences. We’ve played many games, and you can read about them and see lots of game photos, by looking elsewhere on this Harold’s Rangers blog. Finding Maps: I’ve had success using the Google search engine on my computer. As an example, type in a reference, such as “Gettysburg Battlefield Maps” and hit the enter key. You will be presented with a wide array of maps which can be downloaded and printed. You can then use cardboard markers representing elements of your army to move across country to the battle site. By choosing maps in different scales, you can have the game progress across an entire country, a county, into a town and right up to a specific site. For example start with the state map of Pennsylvania, then go to a map of Adams county, then to a general map of the Gettysburg area, then, if this is your goal, to a map of Little Round Top and its environs. This is a free service. On basing your armies: I purchase the boards for basing at any lumber yard. The yard will supply the masonite in 8 x 4 foot sheets, then cut the sheets to size for a fee. One sheet cut into 3 x 3 inch squares yields 512 squares. One sheet cut into 4 x 4 inch squares yields 288 squares. One sheet yields 32 12 x 12 inch squares. For the larger 24 x 24 inch pieces, which are used to transport hundreds of figures, I use either ¼ inch masonite or plywood. I glue the figures to the boards with a small dot of hot glue, which allows them to remain in place indefinitely, or permits easy removal with a pen knife by prying them up. The lumber yard will also cut 12 inch lengths of wooden battens. These are about 1/8 inch in thick and an inch wide. If the yard doesn’t supply the “eyes” from hook and eye sets, you can purchase these at a hardware store. I use an awl to punch a small indentation into the batten to create a starting hole for the insertion of the eye. As the walls used in this game are so tall, I had to make my own ladders. I fabricated several dozen ladders using 12-inch wooden skewers for rails and kitchen matches for rungs. I had to glue two finished ladders together end-to end to make them tall enough to reach the top of the wall. Note: This is the original, longer version of the article of the same name which appeared in the April 2011 issue of Toy Soldier and Model Figure Magazine. It contains all the photos which appeared in the magazine, as well as several others for which there was insufficient room. All rights to this extended article and attached photographs are copyright 2011 by James Delson and may not be reproduced without the author’s express permission.